As opposed to our standard SEO services, local SEO focuses on the specific marketing needs of a business with one or more brick and mortar store or office locations. Local businesses usually need to have a claimed and optimized Google Business page, so they appear in local search results and they need to have a consistent business listing in as many quality standard and niche directories as possible. Reviews are also very important if you want to outrank your competitors. If you’re inclined to do the work yourself, please refer to our Guide to Local SEO and Ranking in Google Places. You’ll see it’s a lot of work and requires an investment in time and resources to rank well in Google for your local market. If you’re interested in having us handle the work for you, please call 503-890-6663 to request a quote. 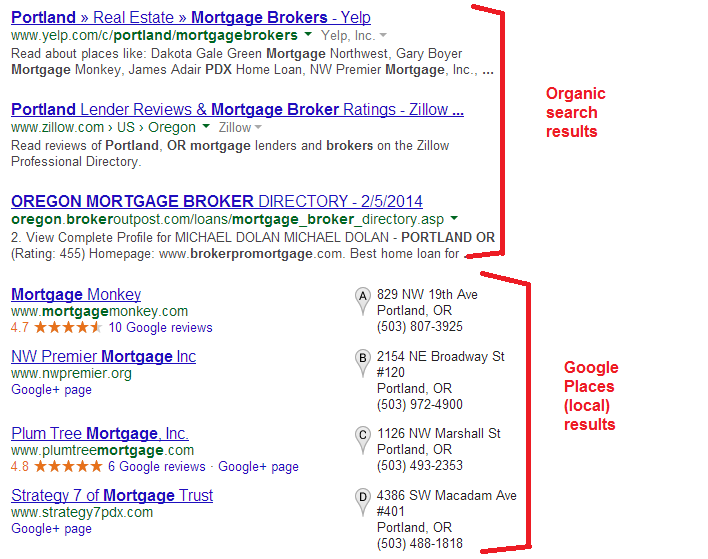 In the screen shot above, you can see the difference between the organic search results at the top and the local Google Business results. You can always tell the local listings because they’re ranked with lettered push pins, from A – G.
When we speak of a business owner “getting listed in Google maps” or “ranking well in local results,” we’re referring to them getting ranked in the area above with a push pin next to their business. You can also see a couple of the businesses above have a Google+ page listed. This is their locally claimed and verified listing in Google. Claiming and optimizing your business’s Google Place For Business page is one of the first things we do. Appearing in the local “7-pack” of A-G Google Business listings isn’t the only way to generate leads for your local business. This post explains where we start to rank your business in Google. Those opportunities are also outlined below. Local Business Listing In Major Internet Directories – When you perform a search for products or services in your local market, Google often returns a handful of trusted internet directories in it’s search results. Some people will click on directories like Yelp, Zillow, Angie’s List or others to refine their search and compare multiple businesses. That’s why it’s important to have your business listed on all the major internet business directories. Website Listing In Organic Search Results – Websites with high domain authority can be shown on the first page of Google, too. If your website is viewed as one of the leading authorities in your industry, it could appear above or below the Google Business “7-pack” results. Usually, sites that have a lot of links pointing back to their site from other sites on the web are the ones with high authority. Generally, these sites rank higher. Videos In Organic Search Results – I can’t stress how important videos are in your online marketing strategy. I get calls all the time from people saying, “I saw your video and it looks like you know what you’re talking about,” or “I saw your video and what you said made sense.” Not only do videos stand out in Google search results, they give you a chance to get face to face with a potential customer. They’re an inexpensive way to market your business. Furthermore, videos can be transcribed into blog posts, giving you another way to increase online visibility, using the same re-purposed content. If you want to increase the likelihood of getting found in Google for local searches, hire us to handle your internet marketing. The goal is to be one of the top businesses listed for what your company does and also to rank for the products/services you sell in your market. The investment you make in marketing your business on the web will serve you well, as success in Google organic search results are a long-lasting lead generation tool. Plus, if you ever plan on selling your business, your website’s authority will greatly influence the value of your business. For a consultation or to get started, please call 503-890-6663.